This is a very personal interview for me as I grew up in an environment of addiction, and my guest Lorraine founded the Australia’s leading addiction and mental health centre. Lorraine Wood is the co-founder and owner of South Pacific Private, Australia’s leading addiction and mental health centre, and is also the author of Love & Addiction, a personal memoir of her inspirational life. 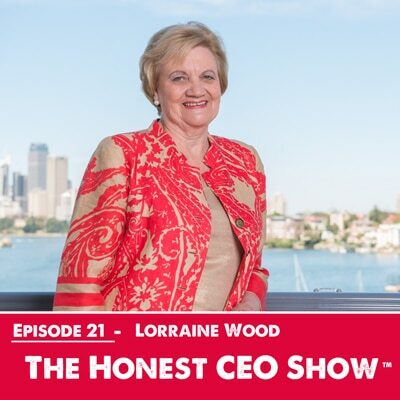 From New Zealand farmer to a successful Australian business owner, Lorraine has certainly had an interesting life full of incredible highs and lows with the highlight being her hospital. South Pacific Private was founded 22 years ago by Bill and Lorraine Wood to offer Australian’s treatment for mental health and addictions which was unparalleled in Australia at that time. Bill had undergone treatment for alcoholism at ‘The Meadows’ in the US and was so inspired by the program, both he and Lorraine founded the hospital in Australia so others could benefit from the treatment program they experienced. Their vision to open the hospital was not a straightforward journey, and they were beset by many challenges that seemed insurmountable. At times, Lorraine and Bill struggled to keep the business afloat (even having to sell their home to keep their vision alive). Since then South Pacific Private has treated over 7,000 people, and this legacy is due to the passion and commitment of two people who took a personal journey to overcome the difficulties of alcoholism and wanted to provide the same service for the Australian public at a time when it just didn’t exist. Sadly, in 2000 Bill passed away and yet, in the midst of grief and loss, Lorraine decided to continue to run the business as her passion for saving lives, and healing families burned as strongly as ever. Over twenty years later, and now in her late seventies, Lorraine is still a familiar face in the corridors, and the patients find inspiration in her story. She still regularly lectures and sometimes still holds group therapy or meetings. Her story unites us all and from it stems the family culture that prevails in the hospital. The difficult journey to overcome alcoholism. The shame of what people have experienced in being exposed to addiction can have a huge impact on a person – Lorraine shares her advice in dealing with this. The stigma attached to depression – Lorraine share her advice on how to seek help. Lorraine shares her advice and tip for people suffering from depression and what daily steps they can take to help overcome depression. Lorraine share the top 3 challenges she faced in building her business and how did you overcome them? Lorraine nearly lost your house while she was building the business. Lorraine shares her turning point. Lorraine provides her advice do you have for anyone struggling in business.